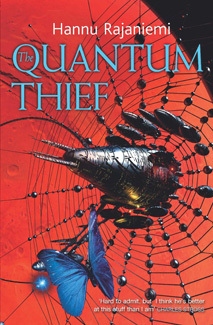 review The Quantum Thief is that rarest of rare birds; a first novel by a debut author which is a joy to read and helps take the science fiction genre in which it sits forward. If, like me, you believe the ultimate aim of science fiction is to question and challenge what it means to be human — and ultimately, to reaffirm your belief in humanity in general — pick this book up immediately. The speculative fiction scene has had a lot of ‘false starts’ over the past few years — debut novels proclaimed to be the next big thing, which turned out to be disappointed and immature efforts. The Quantum Thief is not one of those. Like Patrick Rothfuss’ stellar 2007 effort, The Name of the Wind, Rajaniemi’s novel is the real thing. If you read the synopsis of the Quantum Thief on its back cover, you would probably believe the book is something of a heist story, but set in a post-human Solar System. The book’s description ticks all of the right boxes for a novel which sits squarely in the emerging singularity sub-genre of science fiction. Its protagonist, Jean Le Flambeur, is described as a “post-human criminal”, a mysterious thief who can steal into something called, with echoes of artificial intelligence, the “vast Zeusbrains of the Inner System”, and nicking rare Earth antiques from “the aristocrats of the Moving Cities of Mars”. Throw in a little philosophy to boot — the book’s jacket mentions the popular ‘prisoner’s dilemma’ problem much-debated in game theory over the past half-century — and the archetypal deadly femme fatalle — dubbed ‘Miele’ — and you have a book which could, going by its synopsis, be described as a stereotype of the singularity niche. However, as soon as you start actually reading The Quantum Thief, you realise that it is not these superficial melting pot elements which makes book something special; it is the way that — like masters such as William Gibson and Iain M. Banks before him — Rajaniemi constantly displays and explains the phenomenal world he conjurs for the reader, even while his protagonists are moving through it and changing it as they go. Perhaps the most obvious example of this is the author’s concept of how human privacy is safeguarded, and — when one desires it — breached — in the post-human society of the Oubliette in one of the moving cities of Mars where most of the plot of the book takes place. Imagine if the granular privacy controls of the currently popular social networking site Facebook could be extended to our everyday existence. Imagine if you could choose who sees your face as you walk down the street — or even if you could control if your housemates knew when you were home. If you could hide every aspect of everything that you are and do — with a thought. And imagine, simultaneously, if you could also selectively breach your cloud of total privacy protection to share whatever information you wanted to, with whoever you wanted. A memory, your name, your place of work, other selected personal details. Such a world would be intensely personal — and yet meaningful. Information flows chaotically and dramatically around us in our year of 2010 — out of our control and with constantly damaging effects. But in Rajaniemi’s world, it can be controlled — by every individual. The Quantum Thief is not truly a heist story. Instead, it is more or less a detective novel. And Rajaniemi employs his striking Gevulot concept — as well as many other nimble futuristic human thought combinations and permutations to the greatest of effect within this structure. So many of the tropes that you might find in an Agatha Christie suspense mystery are here — but inverted, turned on themselves by the fact of human evolution and post-singularity technology that change them, while still maintaining much of their original shape. The writing in The Quantum Thief is similarly skilled. Like Ursula K. Le Guin, Rajaniemi displays somewhat of a light touch with his prose. The reader is never forced into any emotional situation or pushed around intellectually. Instead, the author invites his audience’s mind to gradually comprehend the world and characters he has created. He leads you through the book with one hand, walking backwards, coaxing you onwards. Then, just when you have understood the implications of a plot event, Rajaniemi shows you that the track goes still deeper. I don’t want to write too much more about this book; it’s a short one, with the copy I had sent to me by the book’s Australian publisher, Hachette, only clocking in at 330 pages of quite large type. But what I do want those who enjoy science fiction to do is put The Quantum Thief on their list immediately. It is commonly said that the job of science fiction author is to take one technology or scientific concept present in modern day society forward into the future — extrapolating it to its eventual outcome and then positioning protagonists in that altered world. Yet too few modern science fiction authors do that. It’s not enough — in 2010 — to extrapolate what the future implications of the atomic bomb, the electricity network or the discovery of black holes might have on the future of humanity. That was the role of authors in the 1970’s, and they did that well. Today’s readers want to see the future of concepts introduced by the Internet, by Facebook and Twitter, by the iPhone and the personal storage system embodied by Gmail. They want to see how the iPad will change the way humanity functions as a species in millennia to come. Over the past decade we’ve had authors like Charles Stross and Iain M. Banks to do this for us. Now, let us add the name of Hannu Rajaniemi to that list. Perhaps the most exciting thing about this remarkable effort for a first novel is not that it is so good. It is that it sets high expectations for what else we can look forward to from the master to come.